Henry White was born in Yeovil in 1836, the third of the four sons of leather parer Charles White and his wife Sarah, a glove sewer. In the 1841 census Charles and Sarah, together with their four sons; Alfred (b 1831), Charles (b 1832), Henry (b 1836) and Robert (b1839), were living in Belmont. Henry's mother, Sarah, died in childbirth on 5 June 1843 and on 5 January 1845 Charles married Mary Atherton née Dade, at St John's church. In the 1851 census the family were still in Belmont; Alfred had left home and Charles, Mary and Charles Jnr all listed their occupations as glovers while Henry and Robert were still scholars. The situation was almost identical ten years later except that Charles Jnr had left home by this time and 23-year old Henry gave his occupation as a Cabinet Maker having established his own cabinet making business in 1860. His shop premises were in Wine Street as evidenced by his appearance at the Borough Petty Sessions in September 1869. The Western Gazette reported in its edition of 1 October "Henry White, cabinet-maker, was summoned for obstructing the thoroughfare in Wine-street, on Saturday, 25 Sept. PC Saunders proved that he saw a bundle of chairs, a bedstead, and other articles in front of defendant's shop; Mr White said he considered that he had a right to use the land on which the articles stood. Fined 1s and costs." In the autumn of 1870, at Chard, Henry married Crewkerne-borne Caroline Rosa Cooper, some six years his junior. In the 1871 census the newly-married couple were living in Middle Street, close to Frederick Place, Henry listed his occupation as 'Cabinet Maker employing 3 men & 2 boys'. 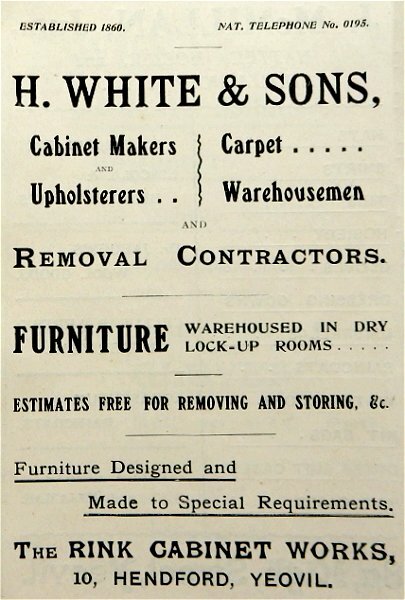 His advertisement of 1874, shown below, notes that he operated from the 'Steam Cabinet Works' in Middle Street. Clearly having some success with his business, by 1881 Henry and Caroline were living in better accommodation at 17 Peter Street. By this time they had three sons; William (b 1872), Arthur (b 1874) and Francis (b1877). Henry gave his occupation as 'Cabinet Maker employing 3 men & 3 boys'. 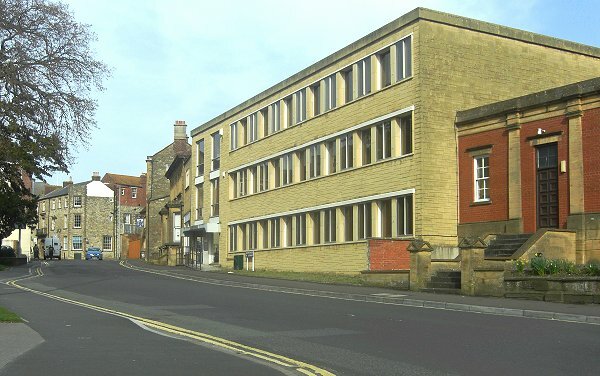 Around 1881 or 82 the building owned by Frederick Greenham known as 'The Rink' in Hendford, (photographed below) was leased by James Bazeley Petter and became known as the Nautilus Grate Works. The building was known as 'The Rink' because it had originally been built as a skating rink. In 1889, following the death of Frederick Greenham, the Rink was put up for sale as part of Greenham's extensive land holdings. It was bought by cabinetmaker Henry White for £800 (about £77,000 at today's value) and Henry established his business there. 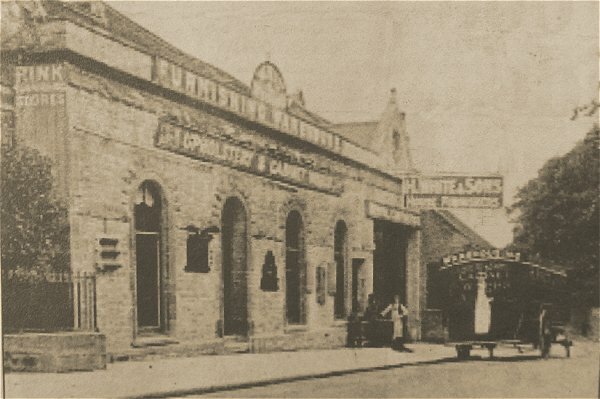 The Rink was directly opposite Hendford House (today's Manor Hotel) and in the photograph below it displayed Henry's signage proclaiming it to be his Furnishing Warehouse. 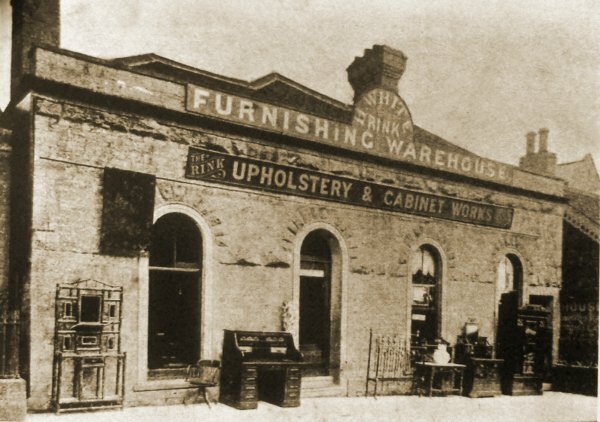 The front of the building was a shop and at the rear was the upholstery and cabinet works where Henry and his employees produced and repaired furniture. In his advertising he claimed it to be the "largest hall in the district" and requested "inspection respectfully solicited". High Street and The Rink (10, Hendford). 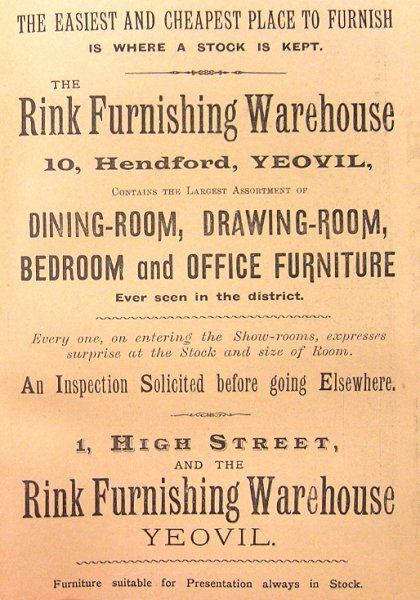 The oldest house furnishing business in Yeovil and district is under the proprietorship of Mr H White, of 1 High Street, and (10, Hendford) The Rink. From the beginning of his connection with the trade, Mr White has adhered strictly to the most straightforward system, while his energy and enterprise has kept him well to the front. Year by year his reputation has increased, and with it his connection, so that he has frequently been obliged to enlarge his premises to accommodate rapidly growing requirements. His shops and warehouses are large, and a staff of experienced workmen are constantly engaged turning out the very best classes of work in cabinet-making and upholstery. A large stock of choice and well-seasoned woods of various kinds is always at hand, and the upholstery is of an artistic and reliable standard. In order to preserve a proper temperature, to facilitate work, and to preserve the furniture in a thoroughly sound condition, slow combustion stoves are used to warm the rooms both night and day. A very fine selection of satin walnut goods are in stock, overmantels, brackets, etc., of this wood forming an exceedingly tasteful addition to the decoration of a house. 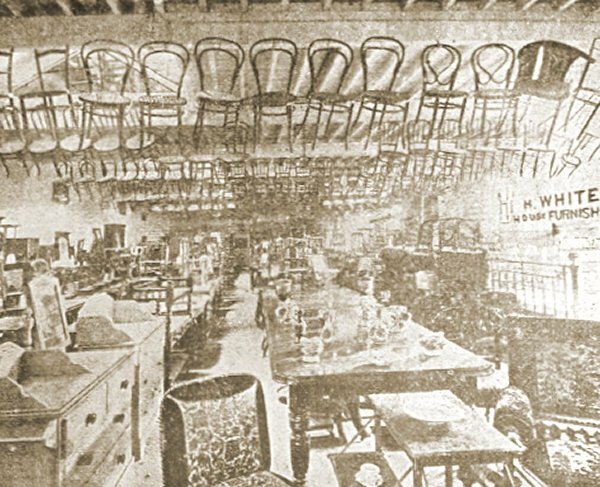 The furniture in the spacious showrooms is very comprehensive, including drawing, dining, and bedroom suites, wardrobes, cabinets, bedsteads and bedding, spring mattresses, velvets, tapestry, cords, gimps, plushes, saddle bags, curtains, carpets, Venetian blinds, linoleum, travelling trunks, and every conceivable description of goods connected with the complete furnishing of the best class of modern houses. Fine roomy workshops are available for the several branches of polishing, upholstering, etc., and the large stores are well stocked with a superior class of hair, wool, and similar requirements for the trade. Some idea of the extent of these works may be formed from the fact that there is available a space of 12,000 square feet for showrooms, all of which is fully utilized for the purposes of the trade. Mr White has had a very long experience of the various branches, and devotes himself constantly to personally superintending every department. No article is allowed to leave the premises until its sound condition has been tested, and a written warranty is given with all furniture sold. Special facilities are given to undertaking orders, which are carried out promptly and carefully in every particular. During the past thirty years the condition of Yeovil has much improved, and the tastes of householders in the matter of furnishing has rapidly advanced, but Mr White never saved either trouble or expense in meeting the public wants. The result is that he now enjoys the leading position in the trade, and has secured a valuable permanent connection in the adjoining counties of Somerset, Dorset, and Hants. 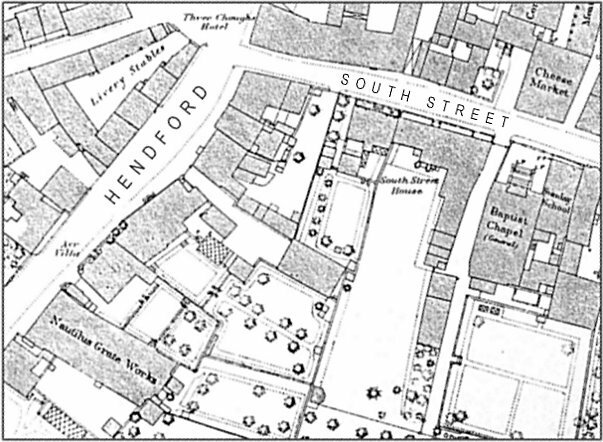 By the 1891 census Henry had moved his family to accommodation over his new shop in a prime location at 1 High Street, on the corner of Princes Street and High Street. Arthur and Francis had by this time left home but Henry and Caroline had a new son Albert (b 1884). Henry listed his occupation as Upholsterer while his son William was a Salesman; the son undoubtedly working in the High Street shop while his father worked in the rear of the shop. In any event Henry and his family had to move from 1 High Street by the middle of the 1890s because the building was demolished in order to build the new bank building for the Capital & Counties Bank which opened in 1897 (which still remains today, albeit now the Co-operative Bank). They probably moved to 'Willowmoor' in The Park where the 1901 census recorded Caroline living with her two sons, William and Albert, since sadly Henry had died just weeks before the census, aged 62. William and Albert both listed their professions as house furnishers and had clearly taken over their father's business. Caroline died in the autumn of 1918, aged 75. This map, based on the 1886 Ordnance Survey, shows the Nautilus Grate Works at bottom left. It had earlier been Henry White's workshops and salesrooms known as 'The Rink'. An advertisement placed in the 4 December 1874 edition of the Western Gazette. An advertisement placed by Henry White in the 1892 edition of Whitby's Yeovil Almanack Advertiser. Henry White's Furnishing Warehouse, known as 'The Rink', in Hendford opposite the Manor Hotel, at that time known as Hendford House. The front of the building was a shop and at the rear was the upholstery and cabinet works where Henry and his employees produced and repaired furniture. Photographed around 1889. The goods on display outside the shop would almost certainly have been produced in the workshop at the rear of the premises. A slightly different photograph, probably of the mid-1890s. Note that the building had been extended by this time with the small gable above the goods entrance. The interior of the Rink from an advertisement in the 1892 edition of Whitby's Yeovil Almanack Advertiser. An advertisement of 1906 advertising Henry's business at The Rink. Note the National Telephone number 0195 - the Western Counties and South Wales Telephone Company had been formed in 1884 and a Telegraph Act passed in 1899 to enable local municipalities outside London to set up their own local telephone systems - although this was a complete failure. Even so, Henry must have had one of the first telephones in Yeovil. 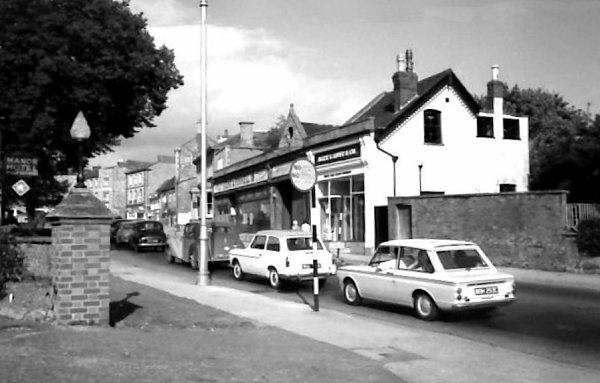 Taken from just a little further along Hendford and outside the Manor Hotel, this photograph of about 1960 looks across to the shops on the eastern side of Hendford. Stent's fish shop is at centre and Dibben's cake shop was next to it. This short parade of shops, remodelled since Henry White's day, had earlier been known as 'The Rink' and was Henry White's Furnishing Warehouse. This photograph of Princes Street dates to around 1875 and is one half of a stereoscopic pair. 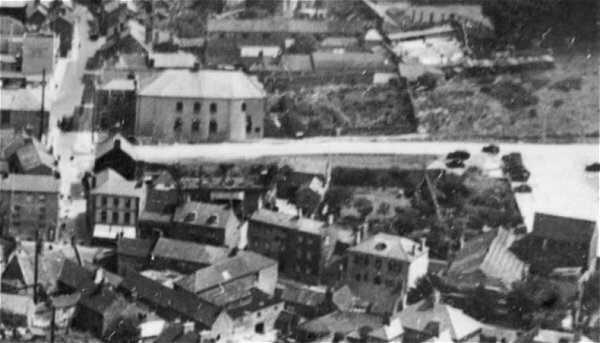 It was taken from the junction with High Street and looks north. At the time Henry Marsh Custard was running his bookshop / printer's / stationers which was situated in the three-storey building to the left of the cart in the photograph. The narrow lane seen between Custard's building and the building at extreme left was colloquially known as Custard's Lane and later widened to become Westminster Street. The imposing building at right, once a private residence, was the hairdressing salon of Frank Gaylard, and home to the 'Yeovil & District Toilet Club', between the 1870s and 1920s. The two-storey building at extreme right, on the corner of Princes Street and High Street, was the home and furniture shop of Henry White. 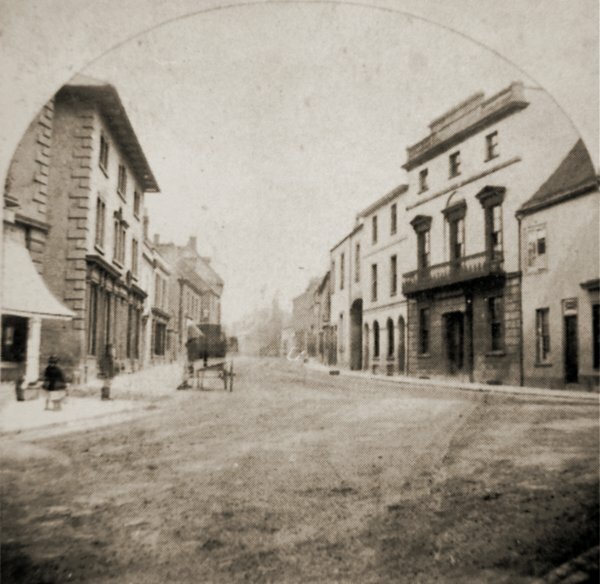 This view of Linsey Denner's premises at 25 High Street was taken between 1887 (when the Sugg lamp was erected in the street outside to celebrate the Jubilee of Queen Victoria) but before 1897 when the Capital and Counties Bank replaced the building on the corner of High Street seen at extreme left. 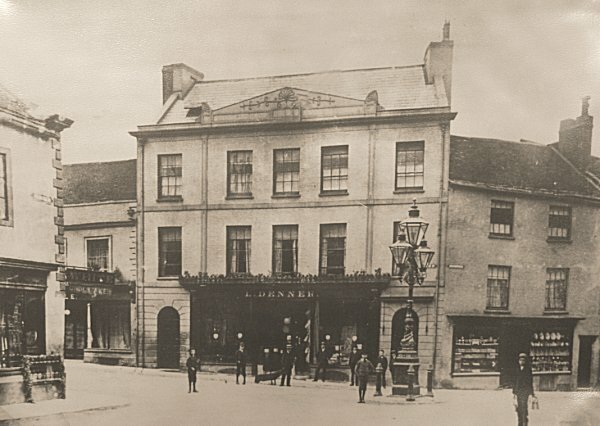 It is this building, on the corner of High Street and Princes Street, where Henry White had his shop and sold his furniture (a piece of his work is seen outside the shop) while he and his family lived above the shop. He almost certainly still maintained the Rink as his workshops and second retail outlet. 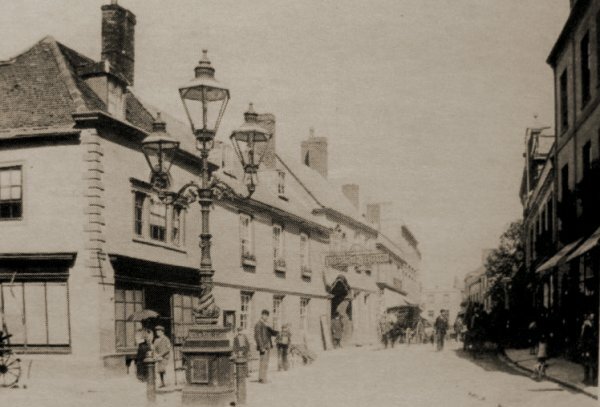 This is the earliest photograph I found of the Mermaid Hotel - it was taken between 1887 (when the 3-light Sugg lamp in the foreground was presented to the town to celebrate the Golden Jubilee of Queen Victoria) and 1897 (when the three storey Capital and Counties Bank opened on the corner of High Street and Princes Street - replacing the building seen here at left). Of greatest interest, perhaps, is that this building preceding the bank, Henry White's home and shop, had an arched Venetian window at first floor similar to that above the Mermaid's entrance.